BACK FOR A SMASH-HIT FIFTH SEASON! Returning in 2019, after another fan-raving season, the Welk Resort Theatre is proud to present MILLION DOLLAR QUARTET, an incredible music experience in Branson, MO! Based on the Tony Award-winning Broadway musical, and inspired by the electrifying true story of the famed recording session where Sam Phillips, the "Father of Rock 'n' Roll," brought together icons Elvis Presley, Johnny Cash, Jerry Lee Lewis and Carl Perkins for one unforgettable night of music. On December 4, 1956, a twist of fate brought together the four future rock and roll legends. The place was Sun Records' storefront studio in Memphis. The man who made it happen was Sam Phillips, the owner of Sun Records and the genius who discovered them all. The four legends-to-be united for the only time in their careers for an impromptu recording that has come to be known as one of the greatest rock jam sessions of all time. And now audiences can re-live all of the excitement of that December night in 1956! Featuring a treasure trove of the greatest rock 'n' roll, gospel, R&B and country hits from these music legends, including "Blue Suede Shoes," "Fever," "Walk The Line," "Hound Dog," "Sixteen Tons," "Who Do You Love?," "Great Balls of Fire," Ghost Riders," "Whole Lotta' Shakin' Goin' On," and Folsom," Million Dollar Quartet not only plays the music that made the Golden Age of Rock and Roll; it tells the stories of the men who created it. From the state-of-the-art lights and sound, authentic sets and costumes, and the incredibly talented cast who portray these legends, Million Dollar Quartet captures the infectious spirit and thrilling sounds of a singular moment in time, when four of the music industry's most extraordinary talents, all in their creative prime, came together for one of the most memorable nights in music history. 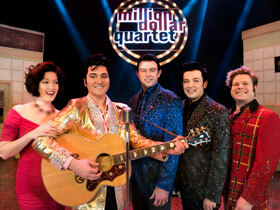 Million Dollar Quartet is available in these packages! Each Package Includes: Lodging, Tickets to Million Dollar Quartet, Free Branson Guest Card, and more!